Referred to as ‘the most Russian city in Europe’ by the locals due to its geographic position in an exclave between Poland and Lithuania, Kaliningrad’s past as a capital of East Prussia is still a very delicate subject for some. 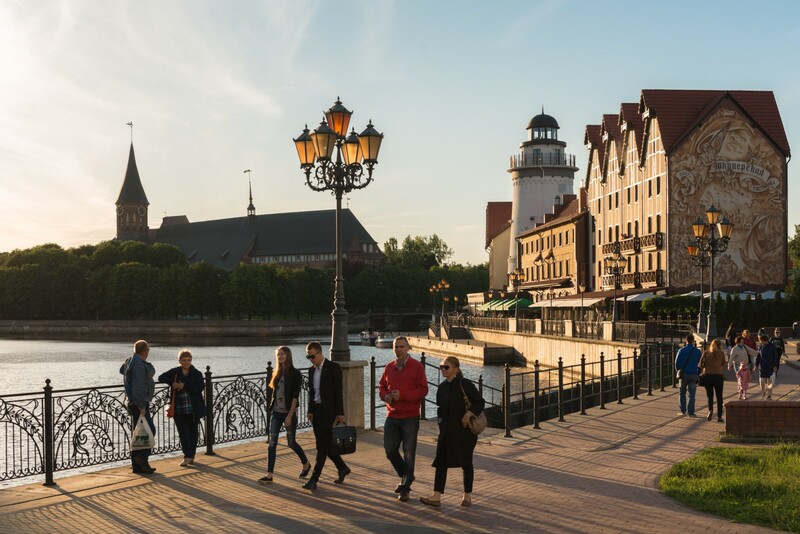 Much of Kaliningrad’s historic heritage including architecture, education and art is connected in one way or another with the city’s German, Lithuanian and Polish legacy. The strategic importance of Kaliningrad during the Cold War as a naval base of the Baltic fleet ensured its status as a ‘closed city’ for any foreigners. Kaliningrad is no doubt a Russian city nowadays, boasting an interesting Soviet past and largely unexplored tourist potential. Great architecture, cultural and educational institutions and the calm vibe of a coastal city make Kaliningrad well worth exploring. However don’t expect to find any stereotypically Russian souvenirs like matreshkas or bears. It is famous for its amber stone industry and Kant island, but Kaliningrad is still to be touched by mainstream tourism. Today, complex political relationships between Russia and the EU have made it more difficult to obtain visas to cross the strict border, and so not many tourists dare try. Everything may yet change after the World Cup. Wide sandy beaches less than an hour drive from the city in Zelenogradsk or Yantarnyi offer great accommodation opportunities for visiting fans and represent a real asset. The Kant Island or Kneiphof with a cathedral and tomb of the German philosopher surrounded by a large park. A beautiful quarter of German style buildings ‘Rybnaya derevnya’ or Fishing village, with several nice restaurants. A new synagogue building across from the Kant Island. If you’re into water fauna and naval history a highlight is the World Ocean Museum. ‘Amsterdam’ night club is open for everyone, with frequent theme parties. During the summer many locals spend their time at the two artificial lakes called the Lower and Upper Ponds, and the surrounding parks. The top pick if you are around the Upper Pond is the Amber Museum while our personal recommendation for the Lower Pond is a cosy small vegan café ‘The Bad Hunter’ (Plokhoy Okhotnik) at the corner of Proletarskaya street, 15. Kaliningrad preserved several of its fortified city gates, and one of them now features a major art hub and residence for painters, photographers and other creative events called ‘Art Vorota’ at Litovskiy Val, 61. Some local enthusiasts are trying to singlehandedly revive Kaliningrad as a tourist destination by running a blog about Kaliningrad in English. They have also set up small museums on Kaliningrad urban life during German and Soviet times. The now abandoned ‘House of the Soviets’ building features fascinating architecture and graffiti, giving an almost rave-party background to the FIFA Fan Fest in front of the building. Planned construction of the administrative building started in 1970 but couldn’t be completed for various reasons. Kaliningrad is generally considered a safe city, although issues of street crime and several registered cases of hate crimes - mostly against Central Asians – have been reported in recent years. You are advised not to walk in remote areas alone or after nights out and use only known taxi apps like Uber, Gett or Yandex. The legacy of being a ‘closed city’ has not helped the diversity of Kaliningrad’s population. Belarussians and Ukrainians make up the biggest national minorities, while Germans make up 0.4% of the population. Within the last five years the general trend of labour migration from the Central Asian republics of Tajikistan, Uzbekistan has also reached Kaliningrad, increasing the ethnic, religious and culinary diversity of the city. The Jewish community has been present in the city since at least the 16th century but suffered enormous damage during the Holocaust. The city’s spectacular synagogue was destroyed during the Nazi pogroms of the ‘Crystal night’ on 9 November 1938. Currently the new Jewish quarter and synagogue are being built to replicate the historic building. The local Muslim community doesn’t have a mosque as a result of the city decision to ban the construction of a building 80% completed. The conflict was very public and led to speculation that the Kaliningrad authorities had given in to Islamophobic sentiment. The local club FC Baltika made headlines in 2017, suing the local newspaper ‘Novye vorota’ due to the racist wording of their front-page report about Baltika’s Ivorian forward Senin Sebai’s red card. The club issued a statement condemning racism in the strong terms and reaffirming their commitment to diversity. Senin Sebai is one of FC Baltika’s most popular players. Kaliningrad does not have active LGBT+ community organisations and LGBT+ fans are advised not to display rainbow symbols outside the official Fan fest or the stadium.